EXCLUSIVE: The Democratic National Committee fired this salvo at Bush confidante Karl Rove in a statement to reporters Monday evening. Until now, the Party has remained relatively silent on the matter. At the White House briefing today, Scott McClellan repeatedly stonewalled legitimate questions from reporters about his earlier assertions - now proven false - that Deputy Chief of Staff Karl Rove was not involved in the illegal disclosure of a CIA operative's identity. 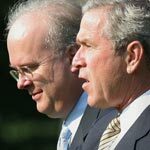 According to reports this morning, Karl Rove had detailed conversations about Valerie Plame’s classified, national security responsibilities with at least one political reporter. Until recently, Karl Rove had denied even knowing Valerie Plame's name. Then, after the release of emails from Time magazine reporter Matt Cooper revealing the name of the White House source, Rove's lawyer confirmed that Rove did speak with reporters about the case. Now, previously secret Time emails reveal that Rove did indeed leak to Cooper information about "Wilson's wife"-Plame. Rove had a short conversation with Time reporter Matthew Cooper on July 11, 2003, three days before Robert D. Novak publicly exposed Plame in a column about her husband, Joseph Wilson. This new evidence raises a host of new unanswered questions. "If left unpunished, this cowardly act will not only hinder our efforts to recruit qualified individuals into the clandestine service, but it will have a far-reaching, deleterious effect on our ability to recruit foreign intelligence assets overseas." Now that we know that Rove told Cooper about "Wilson's wife," who told Rove? Rove had to find out about Plame and her job from someone. Where did this information come from? WHO ELSE LEAKED BESIDES KARL ROVE? Who in the Bush Administration told Judith Miller about Plame? The information cannot have come from Rove, since Rove has "released" Cooper from confidentiality. If Rove were Miller's source, wouldn't he do the same for her? So who was Miller-a reporter working on WMDs-talking to? ROVE had PREVIOUSLY DENIED his INVOLVEMENT - WHY? If Rove is innocent, then why would he claim that he didn't know who Plame was? What did he have to hide? Why was he so careful, saying that "I didn't know her name and didn't leak her name" instead of just admitting that he revealed "Wilson's wife" to Cooper? Even though Cooper's email does not indicate that Rove knew what Plame's job was, couldn't this fact simply mean that Rove did not reveal any more than needed to Cooper? Did Rove commit perjury in front of the grand jury? We know his initial public statements and his statements to Scott McClellan were false. And we know that after testifying once, they called him back. Did Rove change his answers to the grand jury the same way he changed his answers to the press? Originally published on Monday July 11, 2005.